Just a couple of days before school started this semester, I went with some USP friends to Malacca, a short bus ride (about S$45) from Singapore, following the itinerary of another USP traveller, Mark Heng (who’s on exchange in Canada, bless his soul), to learn about the heritage of Malacca and also, of course, to eat! We spent only two days there, staying overnight at a guesthouse called River One Residence (RM36 per night). But two days is probably enough to see and eat all Malacca has to offer. All expenses in, one isn’t likely to require a budget in excess of S$200 . 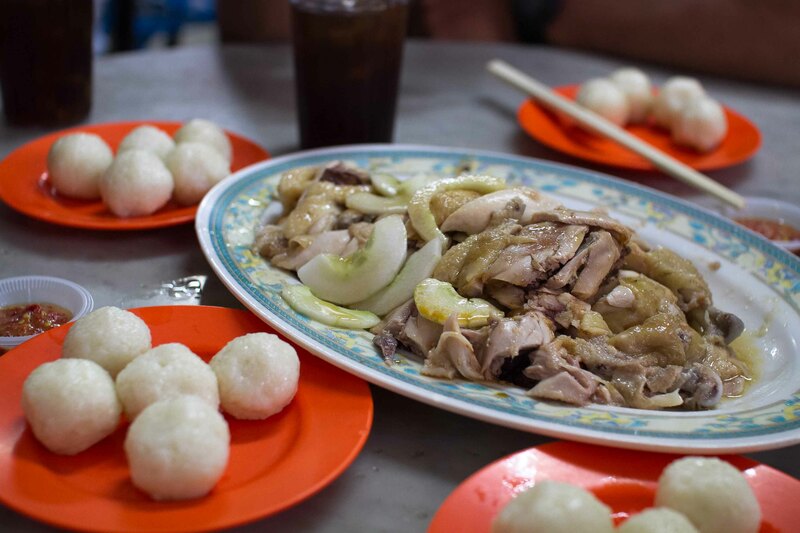 Upon our arrival in the late afternoon, we were hungry, and we knew what we wanted to fill our stomachs with: Malacca’s famous chicken rice balls! Beware imitations that have sprung up around Malacca though; the real deal is at the Jonker Street junction, and can be identified by a snaking queue created by a motorcycle that blocks the entrance. Rice balls come in plates of five and are ordered with tender smooth white chicken meat that you can dip in well-made chili sauce. Copycats are not worth trying; the chili at another chicken rice ball stall was markedly inferior. Even though it can be found in food courts all over Singapore, chendol enjoys a status as a Malaccan delicacy; it also tastes better there, in my opinion, simply with the unique addition of gula melaka syrup. For those of you who have never tried it, gula melaka has a sweet, earthy taste, like dark honey. Like chicken rice balls, stalls a-many sell chendol, but unlike the former, you probably won’t think it a waste even if you try it at any other stall other than the popular Jonker 88 stall. Our first chendol was at a stall we happened to pass by; I ordered a banana chendol and loved it. 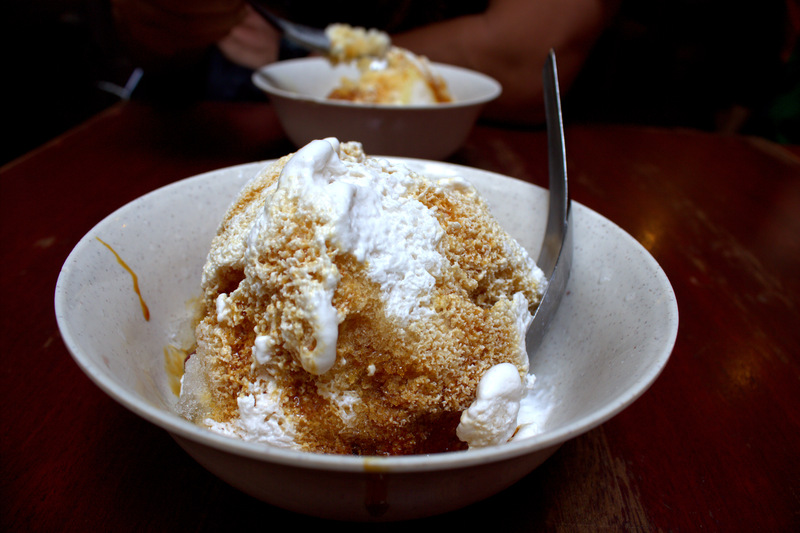 We did go to Jonker 88 the next day though, where I ordered a plain old baba chendol: just shaved ice topped with cream and gula melaka, no other accoutrements. It was a magical moment: the ambience of an old shophouse with 60s props such a rusty typewriter and the soft strains of acoustic guitar playing in the background as I scooped cold, sweet ice into my mouth in the middle of a sweltering morning. The best memories are made when all the senses are engaged. Malacca is also a place you can find fast food extinct in Singapore, such as A & W’s and Chicken McCrispy (disguised as Ayam Goreng McD). 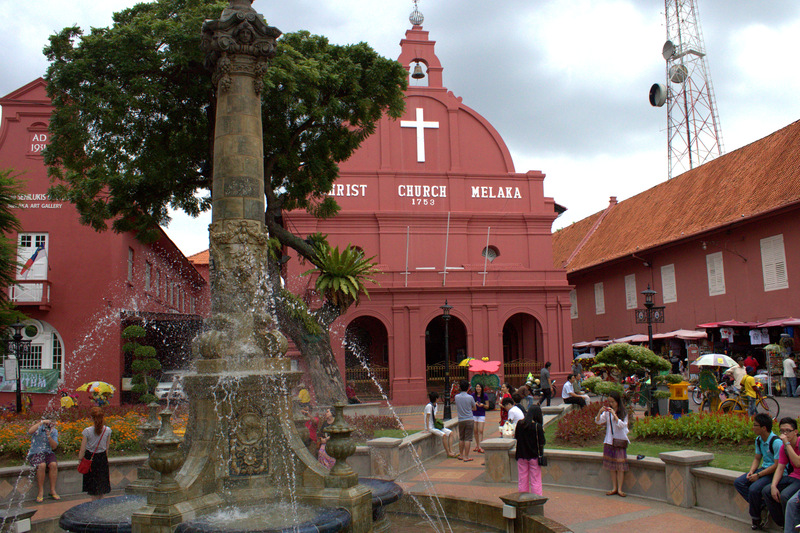 However, a couple of us were also interested in exploring the heritage of Malacca. We checked out a few museums – one is shaped like a life-sized ship – that generally informed us about Malacca’s history as a colony (of the Portuguese, the Dutch, and the British in that order) and bustling sea port, albeit one whose light had dimmed as new maritime superpowers (e.g. Singapore) had risen to displace it in the present day. Like most ex-colonies, there is a love-hate relationship with their former masters; they still keep the famous old red church as well as the ruins of an old Catholic church on the hill as tourist attractions, despite the seeming resentment towards colonialism portrayed by the museums. Interesting, but optional: the Jonker Street night market that opens on Friday, Saturday, and Sunday nights. 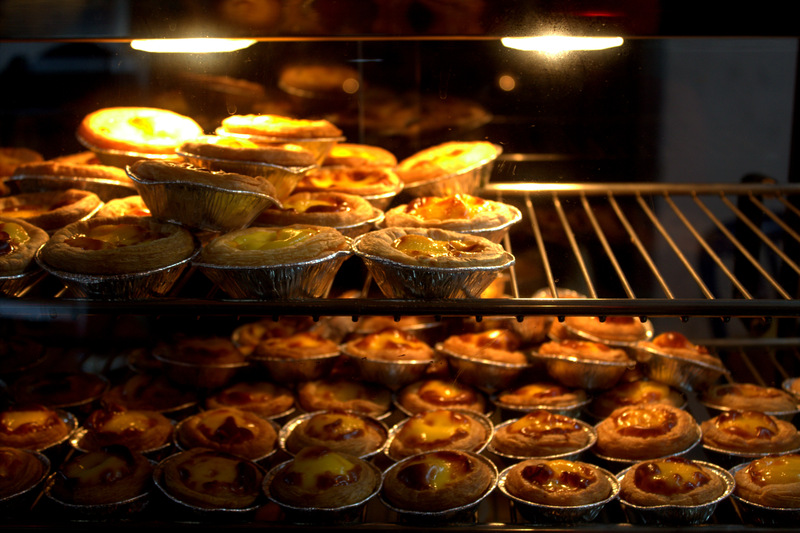 Vaguely similar to night markets in other touristy Southeast Asian cities such as Bangkok and Siem Reap but original elements such as gula melaka sweets and mini Portuguese egg tarts lend it a distinctive identity. A few things which you might want to save your money from: an ultimately underwhelming river boat cruise, and the crabs at the Portuguese seafood restaurants at the seaside, which were dry and overpriced; chili crabs of Singaporean provenance are tastier. 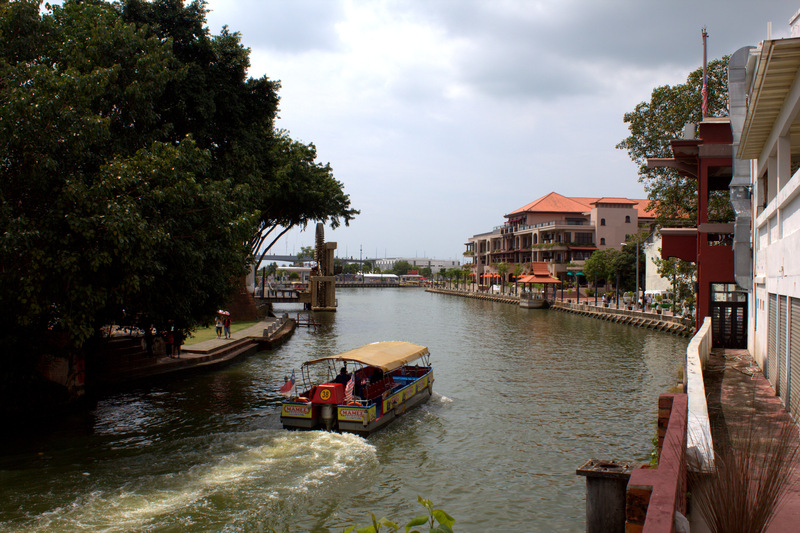 Those quibbles aside, Malacca in general is a charming, idyllic place, perfect for a short and cheap getaway, or a one-night stopover while backpacking in Southeast Asia. hello! 😀 😀 this was from your recommendation, Mark!